My book club met last night at my house. Still Life by Louise Penny was our book. I attempted to serve food mentioned in the book, and since Kielbasa figured in the beginning scenes, I looked for that at Costco. 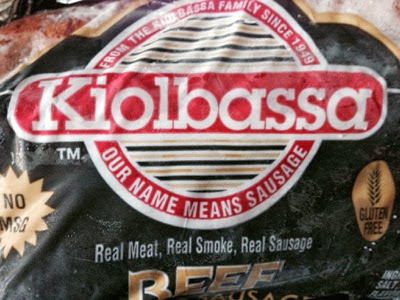 I found this beef Kielbasa from the Kiolbassa Company in Texas. Not being sure how to cook kielbasa, I scanned recipes on the Internet and decided to use a crock-pot. I served these with rolls, vegetables (peas, because of the book), and Mary brought a salad with crumbled blue cheese, which was a great sharp contrast to the slightly sweet sausages. I was surprised by the fat content of the sausages. We don't eat much meat, and we usually eat chicken sausages from Costco. These had much more fat than I'm used to. You might not associate kielbasa with Canada but the world's largest kielbasa roadside attraction is in Canada.